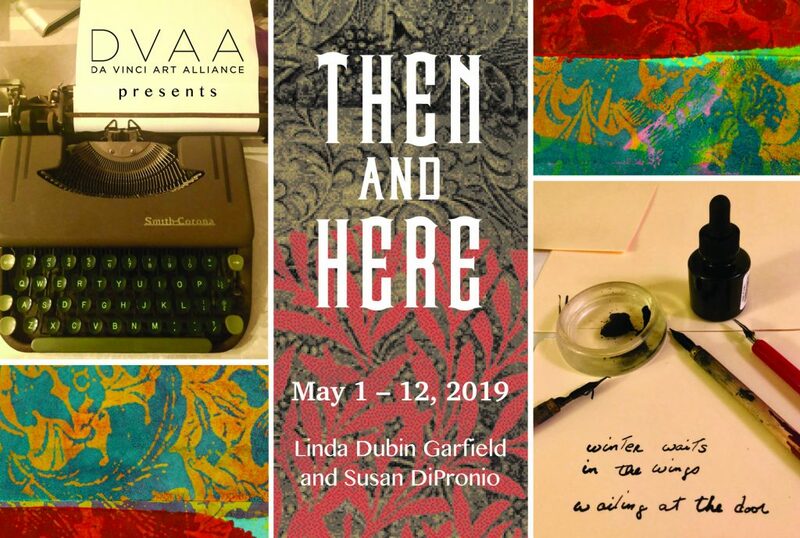 Da Vinci Art Alliance, 704 Catharine Street in Philadelphia is pleased to announce Then and Here a two-person exhibition by Linda Dubin Garfield, printmaker/mixed media artist. and Susan DiPronio, photographer from May 1- 12, 2019. The opening reception is Wednesday, May 1, 6- 8 pm and a closing reception on May 12, 3- 5 pm. Linda Dubin Garfield‘s works on paper and Susan DiPronio‘s photographs are inspired by memories and memoir. In conjunction with this exhibit Garfield has organized mixed media workshops for residents of Atria Senior Living Life Guidance Memory Care Unit. The work created by these residents will be included in the exhibit. The opening is also a birthday party for Garfield and in lieu of gifts, she is requesting donations to the Dementia Society of America. A representative from the organization will be at the opening/birthday party with materials for distribution. This exhibit is organized by smARTbusinessconsulting.org. A portion of sales will benefit the Dementia Society of America. Thank you to Linda Dubin Garfield for the content of this post. This entry was posted in Abstract Expressionism, Art, Art Galleries, ARTsisters, Da Vinci Art Alliance, DoNArTNeWs, Fine Art Philadelphia, Mixed Media Art, Philadelphia, Philadelphia Abstract Art, Philadelphia Art, Philadelphia Art Alliances, Philadelphia Art Galleries, Philadelphia Art Shows, Philadelphia Artists, Philadelphia Artists, Philadelphia Photographers, Photography Philadelphia, Social Practice, Uncategorized, Works on Paper and tagged Art, Atria Senior Living Life Guidance Memory Care Unit, Da Vinci Art Alliance, Dementia Society of America, Linda Dubin Garfield, mixed media art, Philadelphia, Photography, Susan DiPronio, Then and Here on March 19, 2019 by admin1.